UPDATED: Sun., Aug. 26, 2018, 8:42 p.m.
Chen Dan had doubts about betting millions of dollars to make high definition maps of Chinese roads. That was until she took charge of the business at NavInfo Co. and saw how they are essential to self-driving cars, with demand that could reach into the billions. Armed with one of just 14 mapping licenses in China, a permit system restricted to locals that locks out foreign rivals, Chen has built a team that will chart every traffic lane and on-ramp for over 9,300 miles of highways by the middle of next year. With the support of Tencent Holdings, NavInfo is preparing to battle it out with ventures backed by local web giants Alibaba Group Holding and Baidu. Up-to-the-inch accuracy is critical in bringing driverless cars to China and requires a level of detail well beyond the turn-by-turn navigation of GPS services or Google Maps. The mainland’s autonomous vehicle market could be worth $500 billion by 2030, according to McKinsey & Co., and whoever owns the most detailed and expansive versions will have an asset that could be worth billions of dollars. China aspires to have 30 million autonomous vehicles by the end of the next decade but is being very careful about who helps it get there. Government sensitivity about security and access to key data drove the decision to lock out foreign firms, including Alphabet Inc.’s Waymo and General Motors’ Cruise. That means anyone looking to sell driverless cars in the world’s largest auto market has to find a local partner with maps than can be used by their vehicles. To develop detailed maps requires collecting and processing enormous amounts of data. 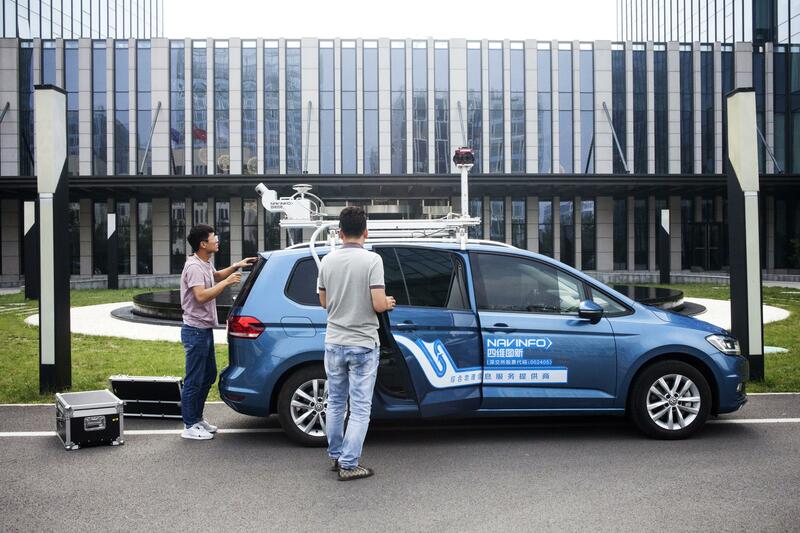 At NavInfo, two engineers can convert a Volkswagen Touran crossover into a mapping car in less than five minutes with a detachable set of 360-degree cameras and lidar sensors. The sensors on the car’s roof shoot out 32 laser beams and measure how the light bounces back, to build a detailed picture of the surroundings. A two-person crew then takes to the streets, one behind the wheel and the other in the passenger seat with a laptop connected to the sensors, monitoring the feeds. The process is repeated multiple times in different seasons to cover all conditions and angles. NavInfo has more than 10 such vehicles in its fleet, collecting all the features of the road, including lanes, tunnels and traffic signs. Some of the data is processed by algorithms before a team of almost 100 engineers gets involved to manually craft lines and improve accuracy. The end result is long stretches of tunnels and road that resemble computerized architecture designs, ready to guide unmanned cars. NavInfo expects to secure its first orders for HD maps from a premium German carmaker this year, Chen said, declining to identify the customer. It’s also working with HERE, the mapping company owned by Daimler, Audi and Bayerische Motoren Werke, on a data standard compatible with all of their cars. The goal of NavInfo’s mapping is to make it compatible with Level 4 autonomous driving, a term referring to vehicles that can pilot themselves in almost all environments and will stop safely if the human driver doesn’t respond to a request for them to take over. A car equipped with HD maps could potentially do away with the expense of its own lidar sensors, which would cut thousands of dollars from the price tag. The key payoff is expected in 2020, when many carmakers are scheduled to start large-scale production of autonomous vehicles. Among the other Chinese companies pushing into driverless cars, Baidu has garnered the most attention. The company is investing in artificial intelligence and has been named the country’s self-driving national champion by the Ministry of Science and Technology. China’s biggest search engine got its own mapping license when it bought a Beijing-based startup in 2013 and has since launched its Apollo project, a loose grouping of more than 100 driverless car industry players including Ford and Hyundai. HD mapping could be a source of strength and profit for Baidu in the future, said Li Zhenyu, a vice president overseeing its intelligent driving group. While there’s no universal rule on how much detail is required to navigate driverless vehicles, the Beijing-based company’s development of its own cars helps it better understand what they need from the map and what they don’t need, according to Li. For the carmakers, there is plenty of jockeying for position. GM has chosen Alibaba-owned AutoNavi for its Super Cruise driver-assistance system on Cadillacs it plans to sell in China. SAIC Motor Corp., the country’s biggest carmaker, bought shares in license holder Wuhan Kotei Informatics Co. and formed a joint venture to develop driverless mapping. Didi Chuxing, the country’s largest ride hailing startup, obtained a license in 2017 and has a team working on maps and driverless technology. Even online retailer JD.com has applied for a HD mapping license as it works on driverless delivery trucks. The lure of the Chinese market is likely to keep foreign carmakers lining up for local partners and give the domestic players an edge, said Mark Schaub, a partner at King & Wood Mallesons in Shangai who specializes in foreign investment in China. “It’s true these guys do have an advantage already,” he said. Published: Aug. 26, 2018, 8:15 a.m. Updated: Aug. 26, 2018, 8:42 p.m.